There are lots of rings around Antarctica. Sailors know the circum-Antarctic winds as the fearsome fifties, the screaming sixties, etc. These winds are not impeded by any land and they drive the circum-Antarctic currents in the Southern Ocean. The surface currents drive the deep currents in turn and the net result is a whirling dervish from the stratosphere to the abyssal ocean spinning around Antarctica. The Antarctic deep current is a centrifugal pump that actively moves the thermohaline circulation. Antarctica is completely circumscribed by spreading centers or “ridges”. A roughly similar configuration must have existed for most of the tectonic history we know from apparent polar wander paths, because there has almost always been a continent at the South Pole. But that is a future post. What is ridiculous about this configuration is there are no trenches. The way this usually works is a continent or supercontinent gets rifted apart by a spreading ridge with new ocean floor that is “welded” to the continent. the weld prevails in the shoving match and the opposite side of the continent breaks from the ocean floor and slides over it forming a trench where that ocean floor is forced down and presumably back to the mantle. This process is clear where the Atlantic has separated Pangea and major trench systems have formed along the Pacific coasts of the Americas and Eurasia. 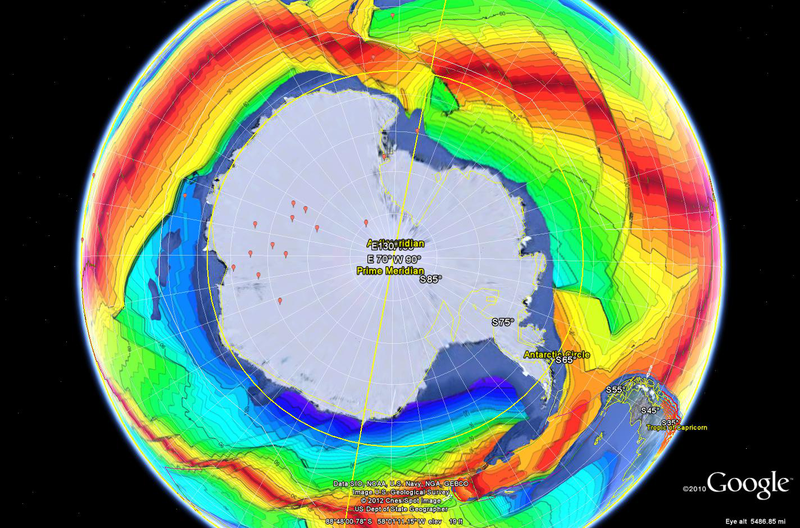 As you can see Antarctica is being pushed from all sides but nothing seems to be giving. The isochrons seem symmetrical about the ridges so it is not like they are dogging it on the Antarctic side and pushing mostly north. So either the ridges continually emerge around the South Pole and move north like smoke rings or the raving lunatics who maintain that the earth has been growing are right. This entry was posted in Geography, Paleogeography, Plate Tectonics, True Polar Wander and tagged Antarctic, Antarctic Peninsula, Antarctica, Polar Regions, Science and Environment, South Pole, Southern Ocean, West Antarctica. Bookmark the permalink.